After doing a couple of films down South and featuring in TVCS for some of the biggest brands, Saba Saudagar is all set to make her debut in Gujarati cinema with 'The Reunions'. In this interview, the young actress talks about the film, speaking Gujarati dialogues, how regional cinema is evolving and plans to do Hindi films. No, this is my first Gujarati film. I have done a couple of films down South in the past. How did this film happen? I was called for a screen test. I was initially called to audition for a different character but after Nannditaa ma'am met me, she suggested that I should play this character called Niketa. She said that my talent should go to waste and I should be doing a substantial role. I was glad that they considered me worthy enough to be playing a bigger role. The only concern for me was that I had to speak in Gujarati but then, I thought that as I had already had an experience of speaking in Tamil and Telugu for my South films, learning Gujarati dialogues would not be difficult. Did you face any difficulty while learning or saying the dialogues? No, I believe I have a good grasping power. I do not speak Gujarati in real life but I have had neighbours and friends who are Gujaratis, so I have heard people speak in Gujarati quite often. 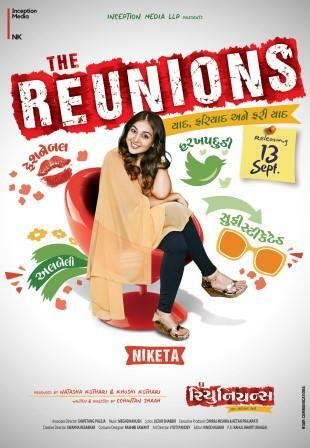 As the title of your latest film 'The Reunions' suggests, it is about this reunion of seven friends after ten years. How does your character evolve from the time you are in college to the time you meet your friends after all these years? When you are in college, you see the world with rose-tinted glasses. You tend to be a little over-confident about things. When you step out of college you realise how tough life is. A person goes through different kind of experiences and evolves accordingly. I am playing a character who is very practical and wishes to have a stable life. After college, I go to France to study interior designing. I manage to have a stable career and then, I meet my old friends at this reunion after ten years. Most people have certain notions about regional cinema. They think it mostly depicts the heartland of the country. This film looks very youthful and urban. Comment. It is not a typical Gujarati film. I think things are changing gradually and people are responding to this change very well. I watched 'Chal Man Jeetva Jaiye' in Mumbai. It was running to packed houses here. Even when I used to see the rushes, I would feel that we are making something different from the kind of stuff that is usually made in regional cinema. Once Chintan's father came to our sets and said "Hindi film laage chhe" (lit: it looks like a Hindi film). You have worked in different regional film industries. Do you wish to do Hindi films as well? Everybody wants to do Hindi films. For some strange reason, I always wanted to become a South star and the, work in Bollywood. A lot of people think that regional cinema is inferior to Bollywood but I never had that notion. It is great to explore a different landscape and diverse cultures. It is not the language or the industry but the working environment that matters. I have shot for an independent film co-starring Atul Kulkarni. It was shot a log time bak and is finally slated to release this year. I am in talks for a few more projects.